By reading the entirety of this webpage you will become more informed about your purchase, than any other single source available anywhere on the internet! 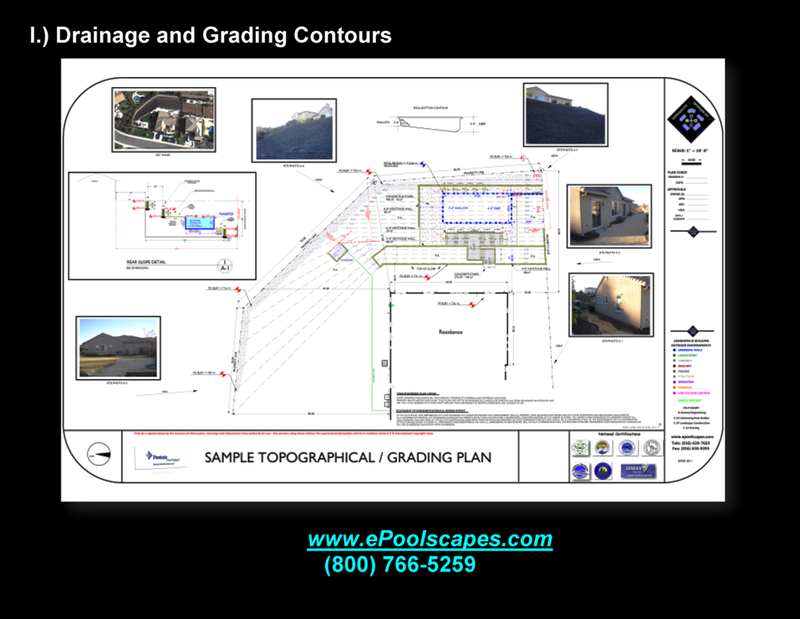 How to better interpret Landscaping Estimate or Bid…? 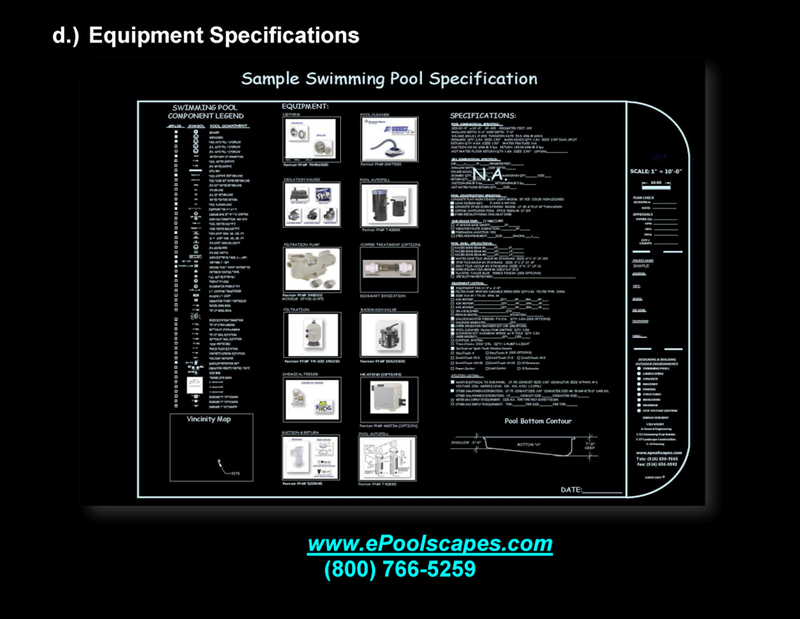 One of the many functions that a professional “estimate” is suppose to provide you, is to offer an organized and standardized framework, in which a comparative analysis can tally the measurements of comparative values, right? 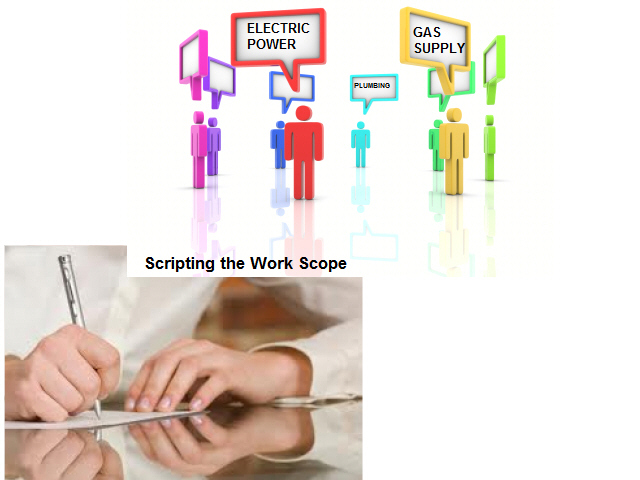 Getting 3-Bids will not provide you examples of the intentions for a mirrored approach to the Work Scope. Although…a detailed “Request for Proposal” can unveil both the differences and transparencies in approaches, if you take the time to organize your requested solicitations. 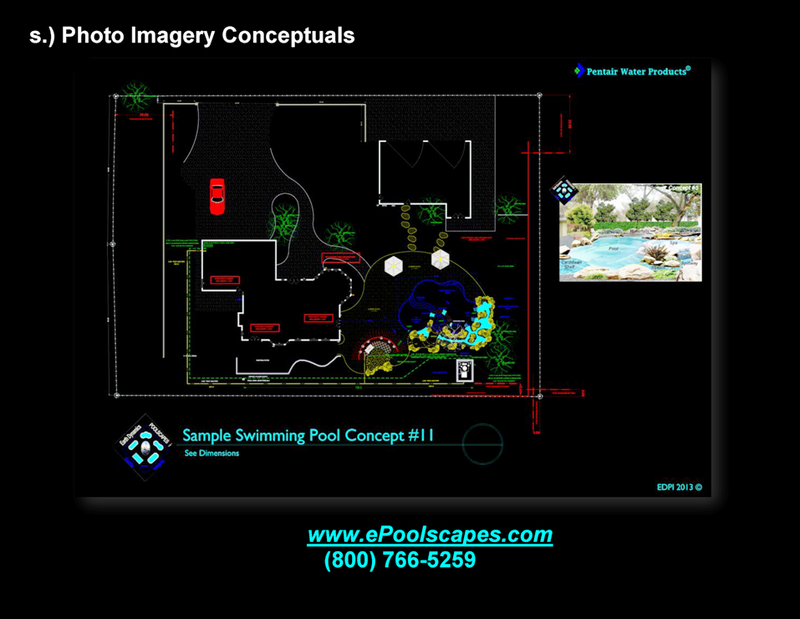 Swimming Pools and landscaping…can most often be the 2nd largest expenditure in a Homeowner’s lifetime! The seriousness in which one engages the process shouldn’t involve gullibility, but should be founded in the truest expression for the intentions of the performance. Developing an itemized list of inclusions and or exclusions 1st, will result in providing you with something to truly analyze, as your bids come in. What might not be said, in between the Line Items from one contender to another, can also illuminate many disparities. 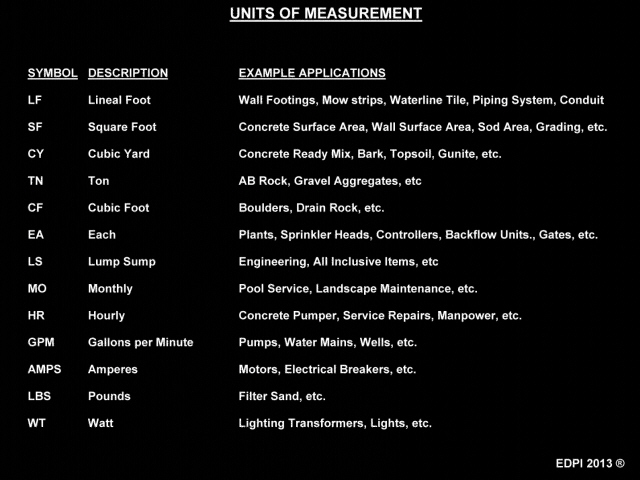 In order to evaluate comparative meaning from incoming prices, common units of measurement (UM) must be established (See Units of Measurement below). In doing just a little homework it can result in getting an “+A” grade for the kind of results your deserve! 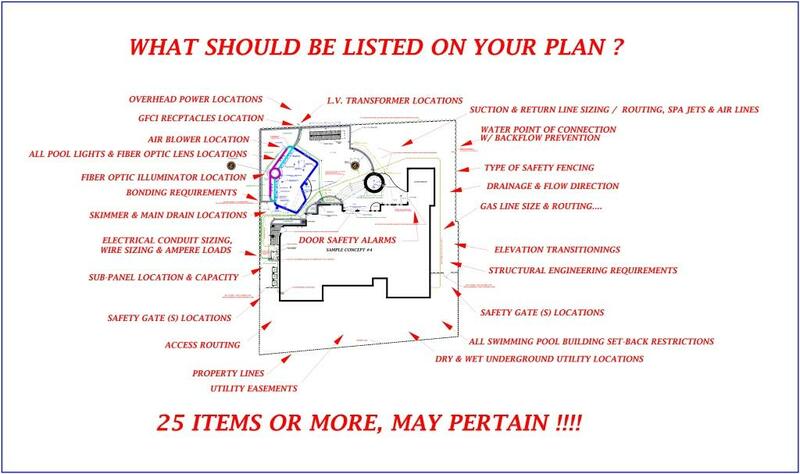 What should be on a plan…? 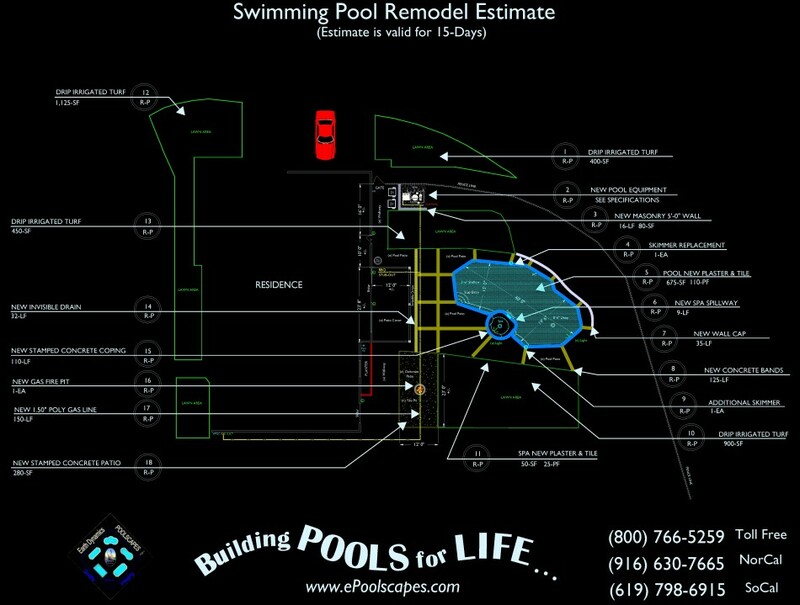 Before an estimate can truthfully become tallied, the measurements should be derived from a scaled drawing. 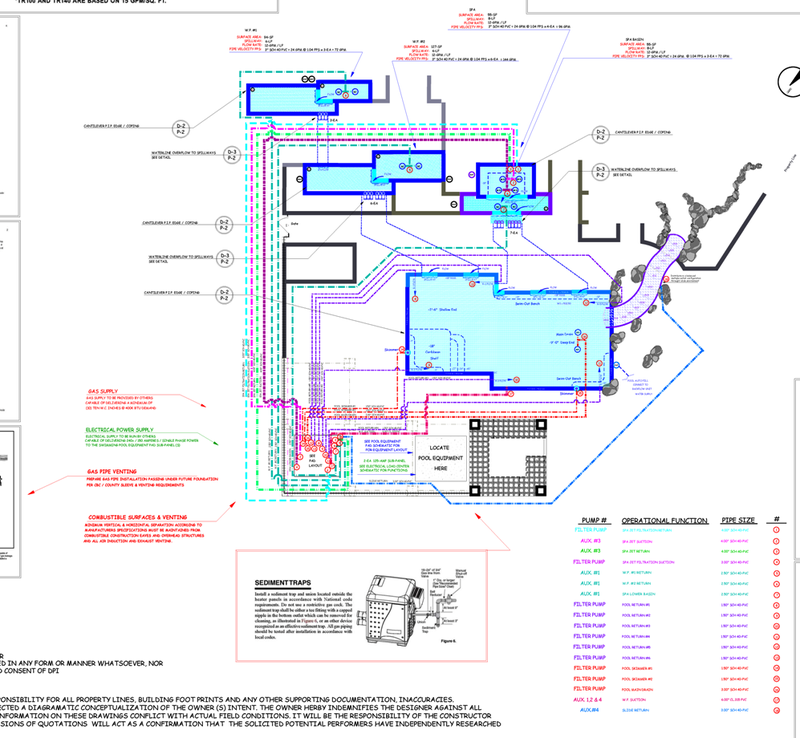 This exhibit is a requirement for gaining the approval for an Home Owners Association (HOA) / Architectural Review Committee (ARC) and a Building Permit. Please realize that the HOA / ARC and Building Department’s requirements have very little to do with fulfilling your desires! The closer this diagram reflects your desires, the closer it has a chance at delivering upon your expectations. Equally important…the accumulative totals for the assessments being expressed in a quotation, must also be derived from an equality in experienced and knowledge between contenders. In the absence of establishing such parallels in a performer’s ability and intention, a like-mindedness to the approach couldn’t be ascertained, from just the pricing! 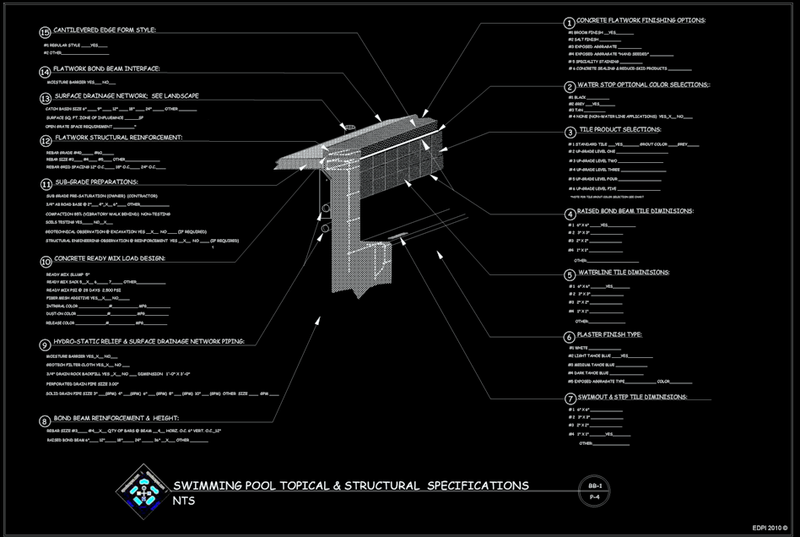 The Billing of Quantities (BOQ)… Unfortunately…the Swimming Pool Industry’s estimating standardization hasn’t universally come to terms with what should be identified as acceptable industry practices and applications. 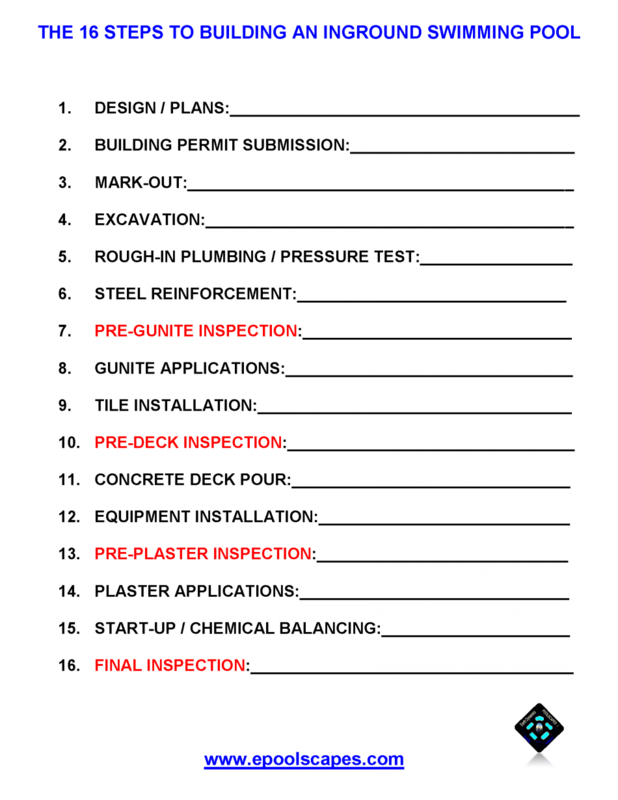 Most…”Request for Proposals” (RFP) fail to solicit a contender using any form of quick reference for preforming an itemized comparative evaluation. What happens too often…is that responding estimates exhibit a lack of important details and weak commitment but, are very attractive because they appear as costing less! Achieving a 1st Class Standard to any approach being considered, will most often cost more than a 2nd Class Standard! This is why it is so necessary to prepare a plan that can anchor commitment and aid clarity for the intended standards that will apply. Becoming familiar with the “Units of Measurement” that are to be interpreted, will greatly aid the process for making comparisons. Absent this “yardstick“, a price is worthless for providing a comparison! 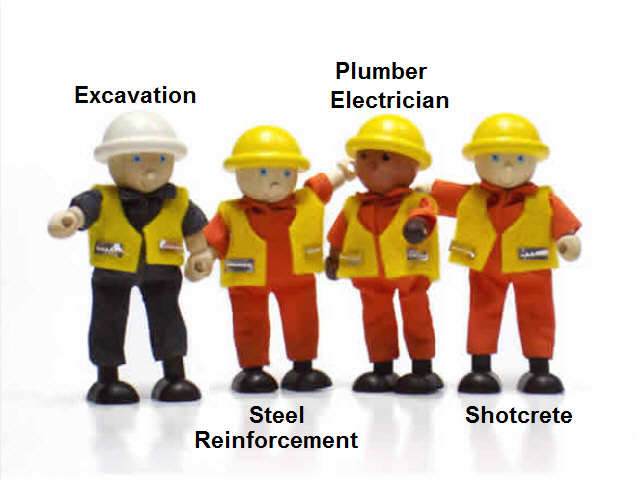 A line item accounting for quantities should also include identification of how those quantities are measured. 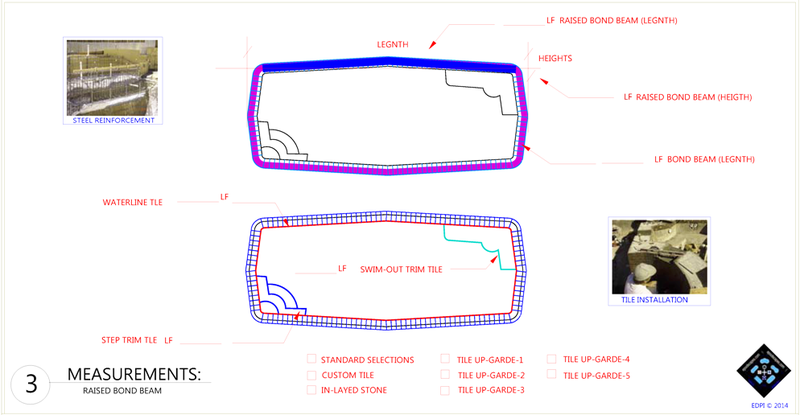 Comparisons should start with understanding what should be compared and this process should start with establishing the commonalities in the descriptions, definitions and terminology that will be expressed as the units of measurements. In the absence of such a “yardstick“, a lower price is only a tool for creating distraction! 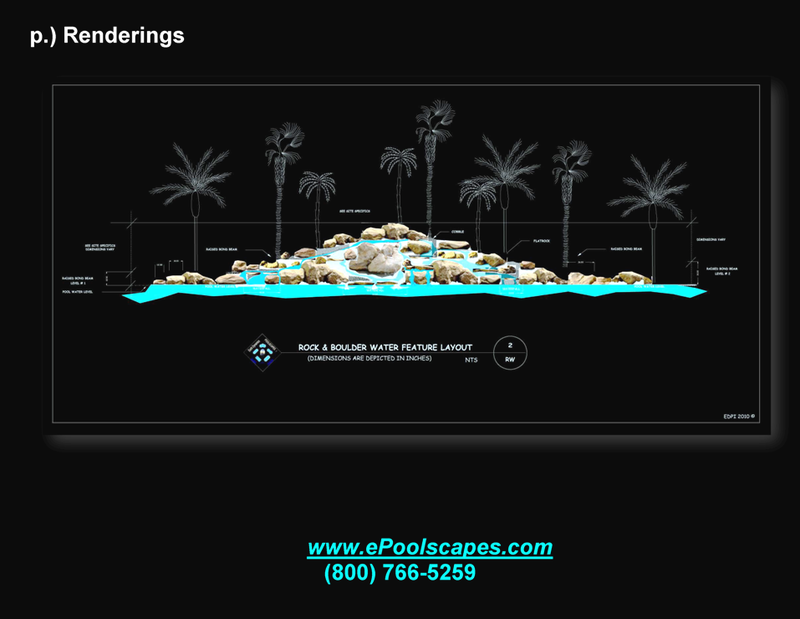 Second only to the purchase of a new home, a swimming pool and landscaping project can most often represent the single largest investment in one’s lifetime. So…we feel that this is deserving of concentrating your attention to detail and deriving the “yardstick” for measurement from an intelligible and decipherable meaning for the implications of value. 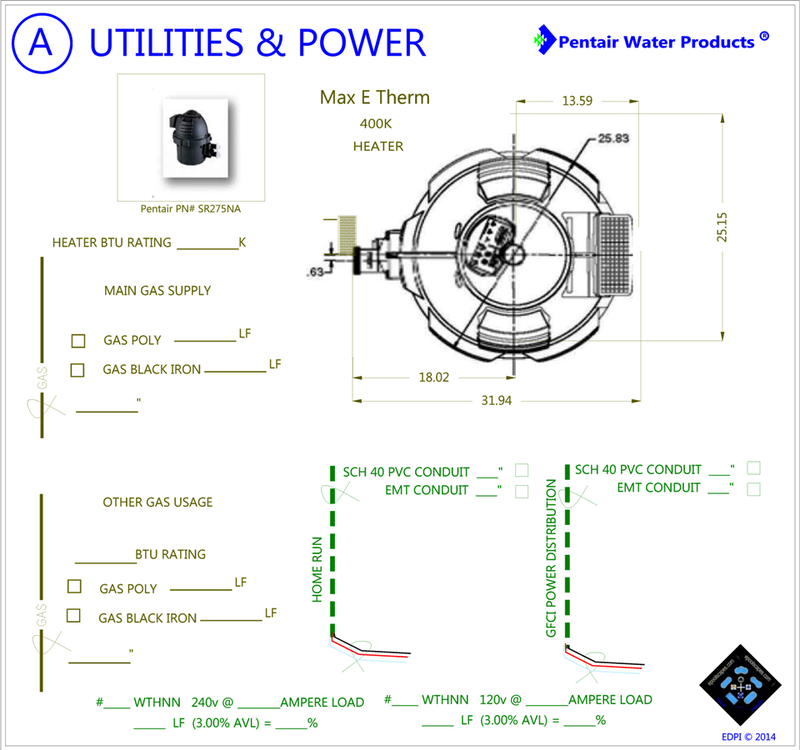 Please consider the framework that is exhibited on this webpage, as a possible “Boiler Plate Standard“. In seeking other responses to your Request for Proposal (RFP) the investments in digesting the information, will yield the returns of a lifetime! 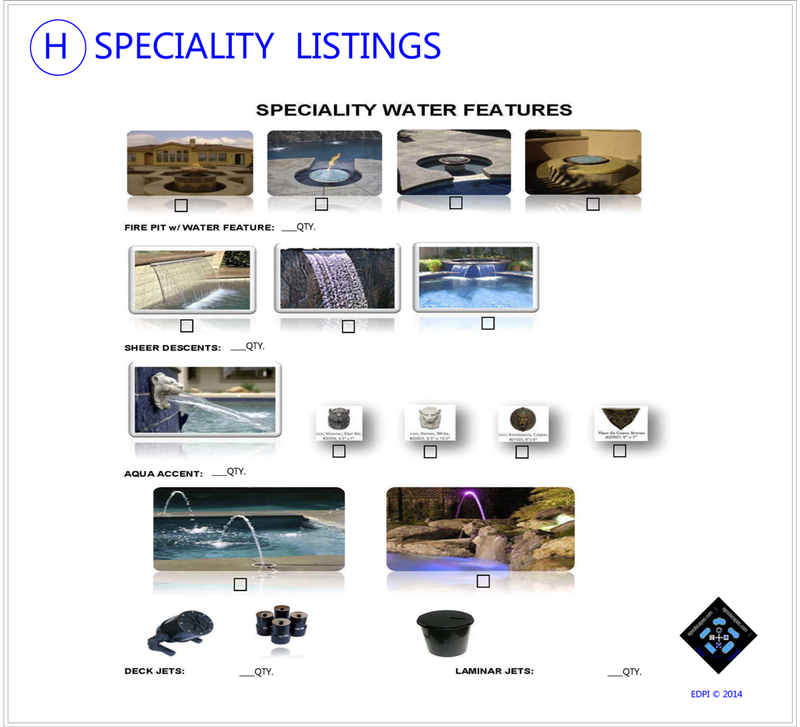 Our Bids involve several categories. This effort is made in order to be transparently accountable and equally important, to provide assurances that “everything” being quoted will meet the expectations for “everything” presumptively being interpreted as included! 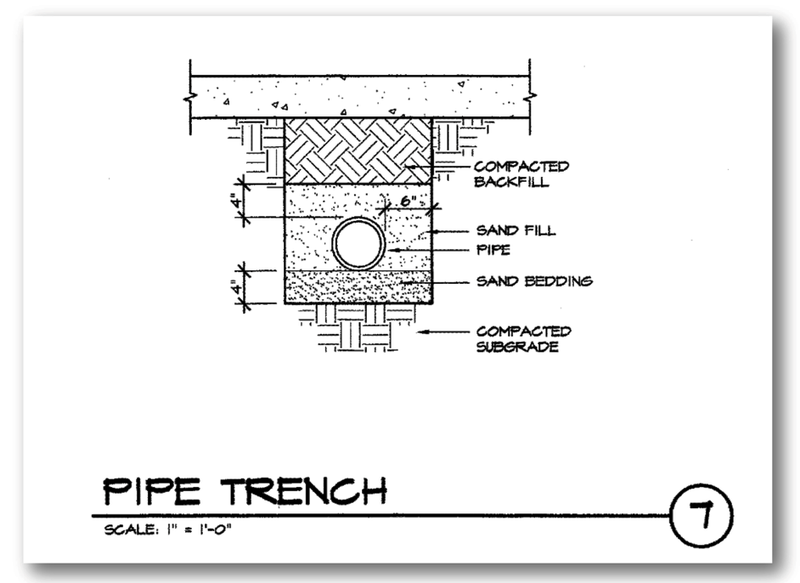 The assessments for the utility runs, should involve determining the sizes and required capacities of pipes, conduits and wiring. 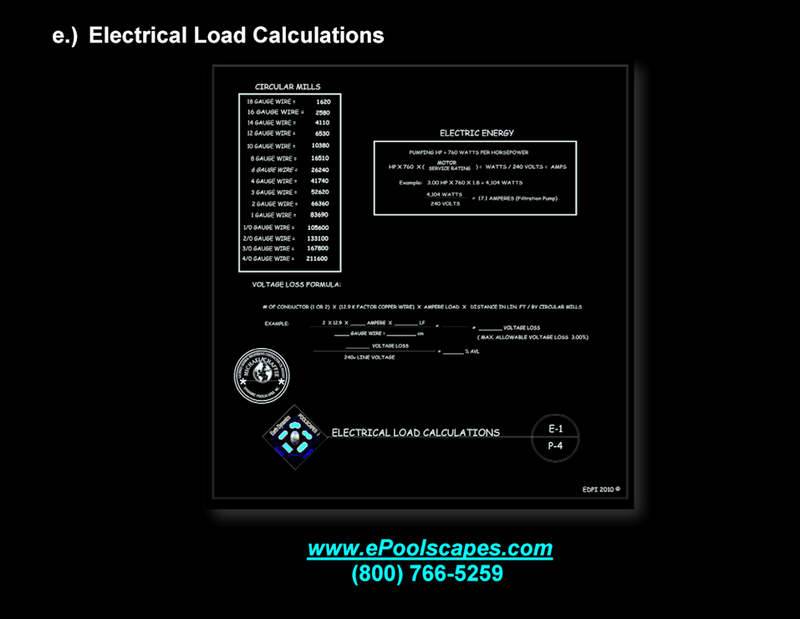 Longer distances and higher ampere electrical loads will require larger sizes and more costs. 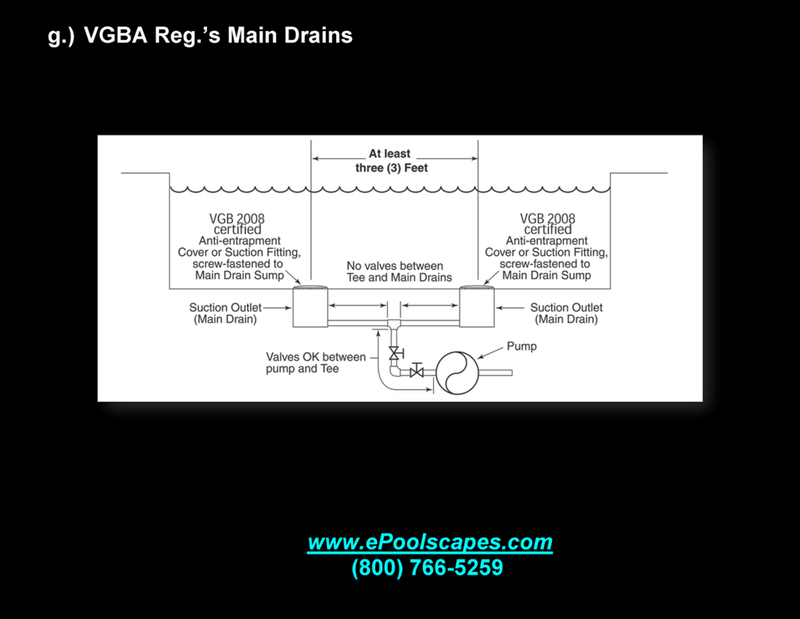 If a BBQ, Fire Pit, Outdoor Heater and or additional GFCI Receptacles are intended, then the larger sizing should be noted on the estimate, rather than just assumed. 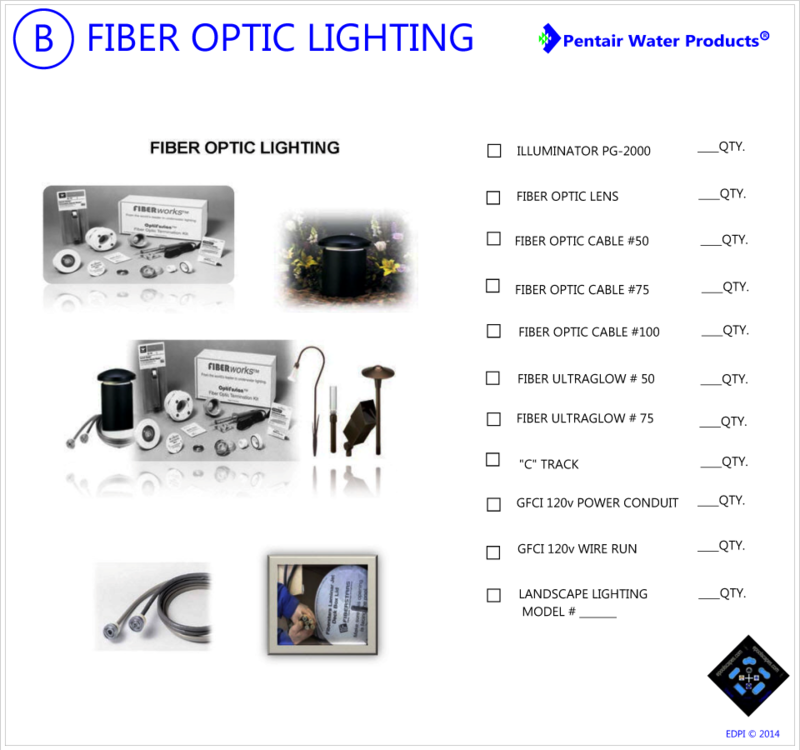 Fiber Optic Lighting is one of several forms of lighting, that is available. 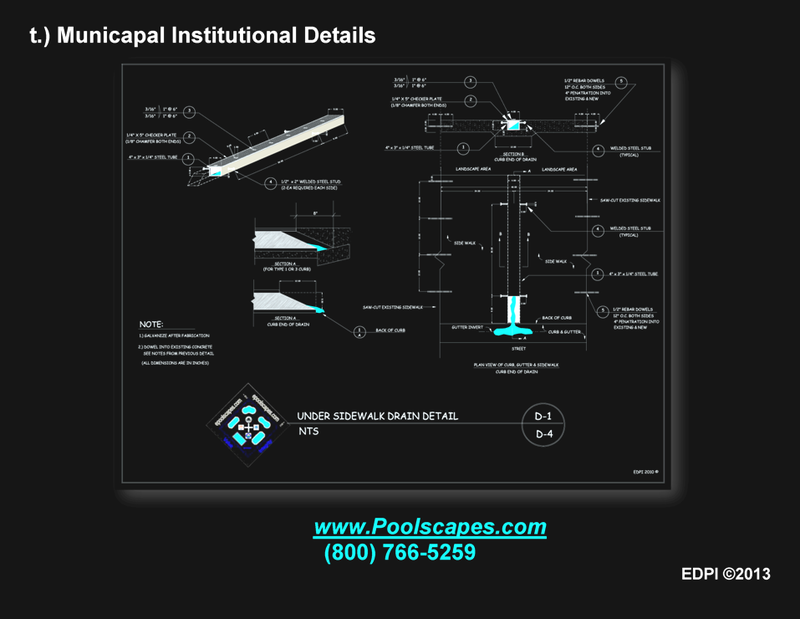 It has variable color capabilities and can provide a “pinpoint” style of illumination, in addition to a cantilevered under-deck rope style. F.O. 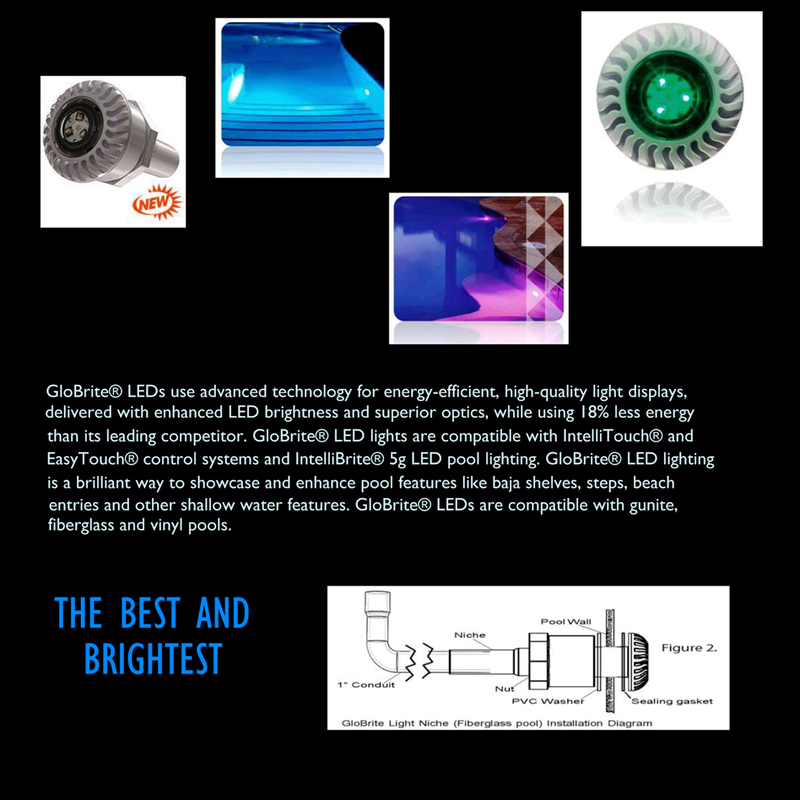 Lighting is unique to special applications. 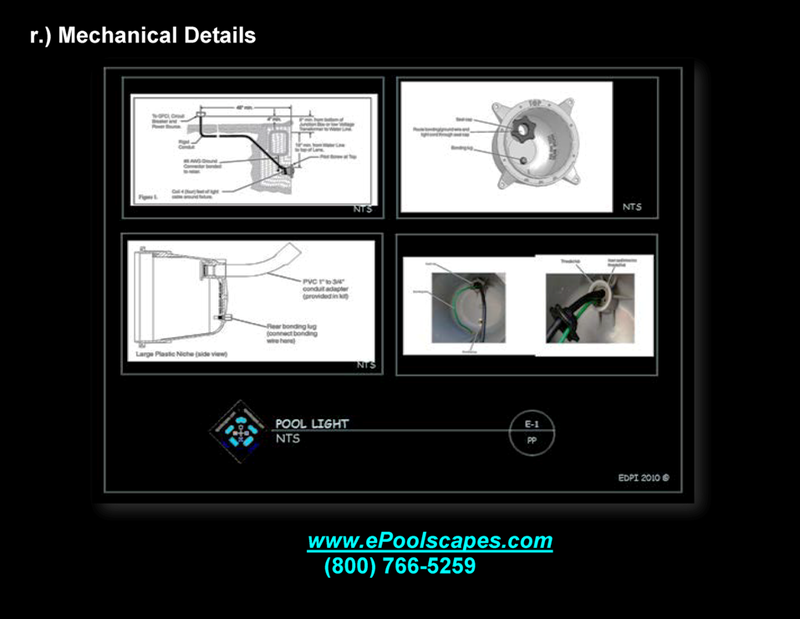 Generally, Low Voltage LED Color lighting will be utilized for most pool and spa applications. 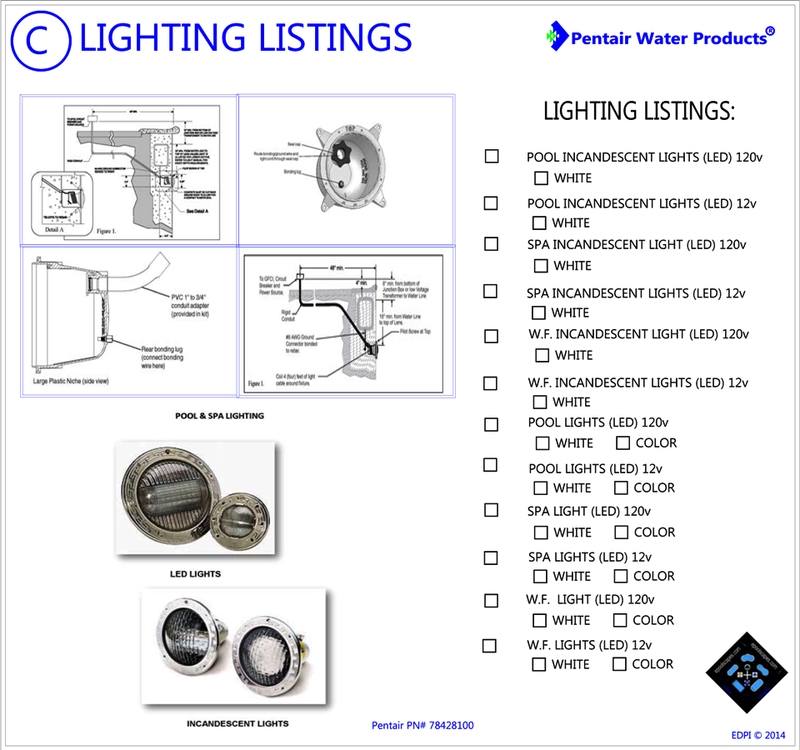 The assessments for the lighting fixtures and the necessary runs should also involve the designation of circuits. 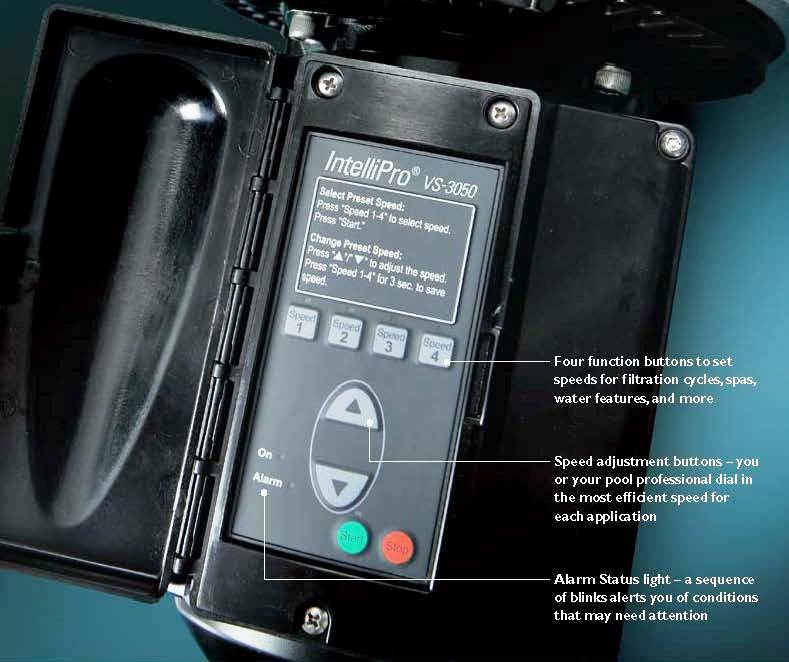 Fewer control circuits and or lights, will cost less! 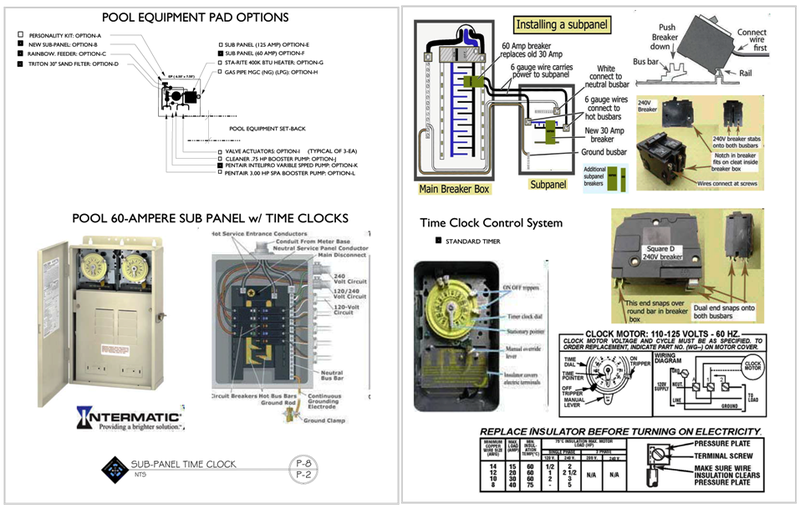 The anticipated conduits, wiring and available automation control relays need identification, in order to be assured that the operational electrical loads will facilitate the desired results and the “zoned” lighting functions will achieve your desires. 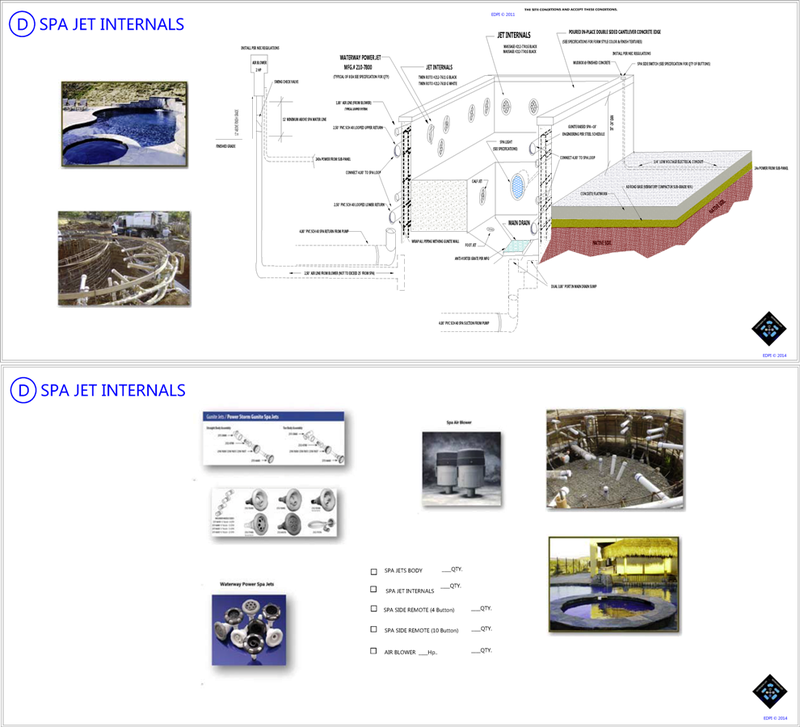 The assessments for Spas, can involve several options. 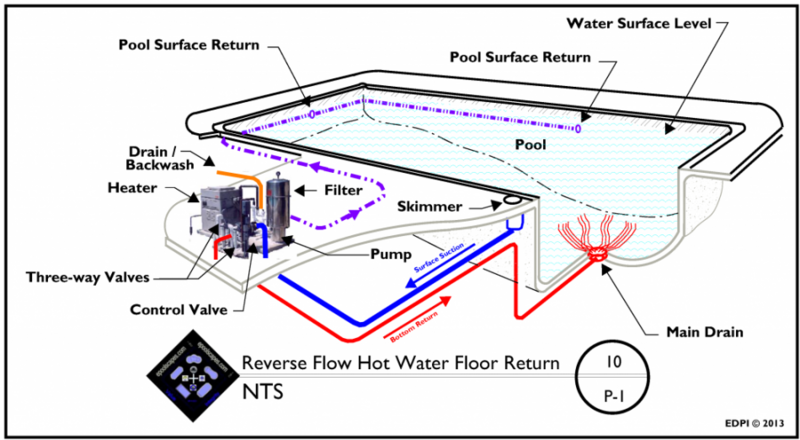 When graduating from the simplistic industry standards of just a “Hot Tub” that’s full of hot water, to the therapeutic hydrotherapy action of Custom Jets and Air Blower, there are vast differences in pricing and results! 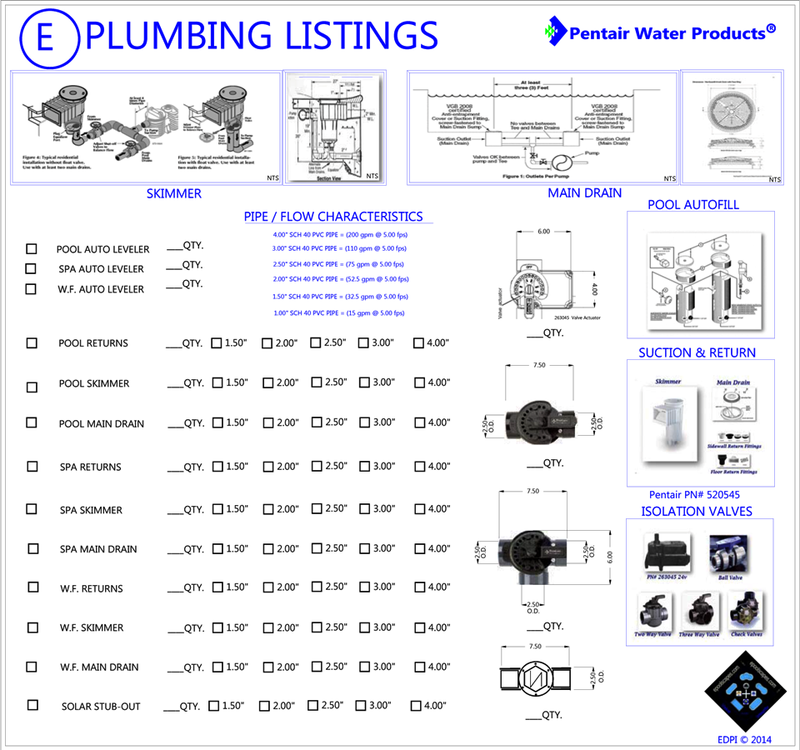 Become familiar, and be sure that your estimate expresses your desires for Jets, Air Blower, Pipe Sizing, Controls and the intended function modes of operation. 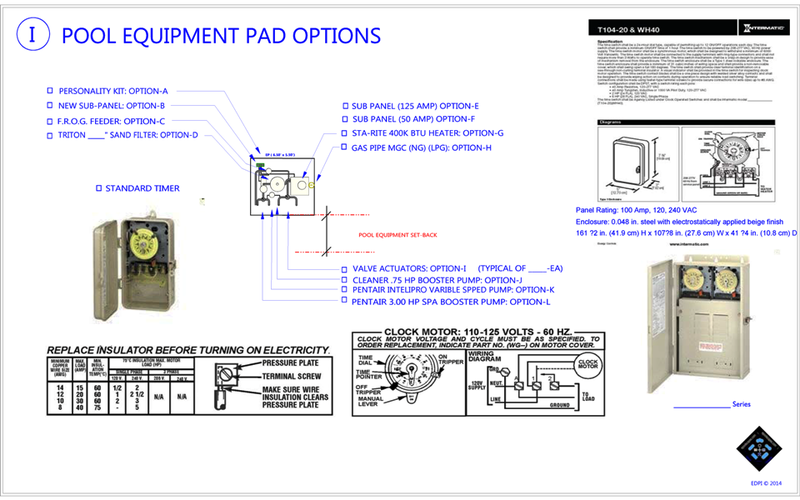 The assessments for the Equipment Pad’s layout can involve several very important considerations, or not! 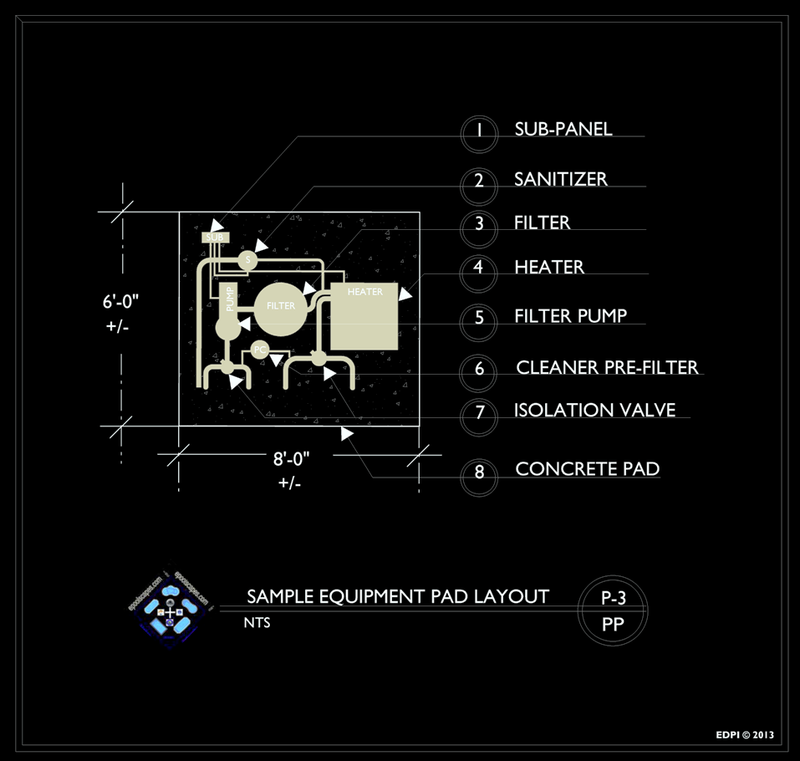 An “Equipment Pad Schematic” can offer you the familiarization with the Controls and the intended function modes of operation, that you will be paying for, one way or another!. 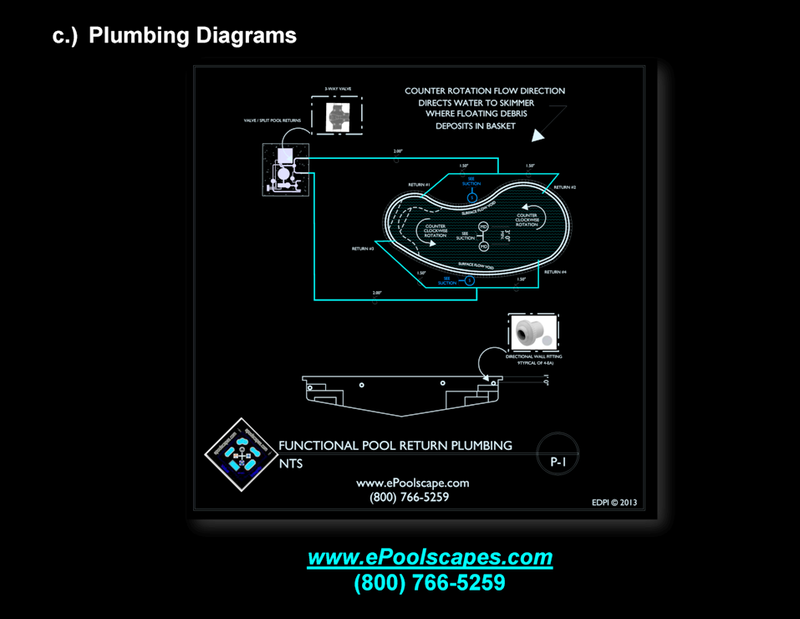 Be sure to ask for a diagram that mirrors intentions. 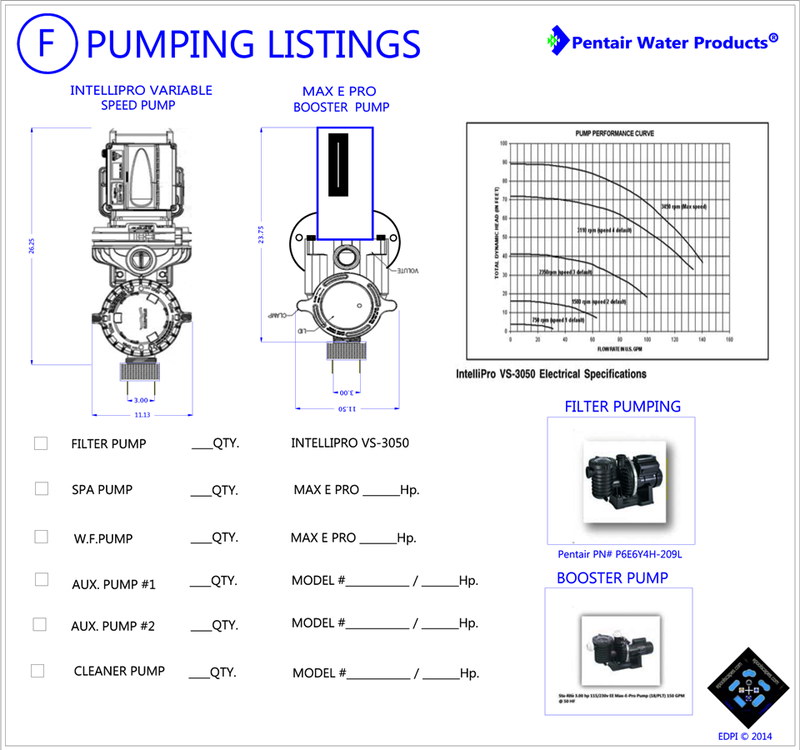 The assessments for the Pumping System can involve several very important considerations, and these decisions will effect the out come of how efficient your pool consumes power! 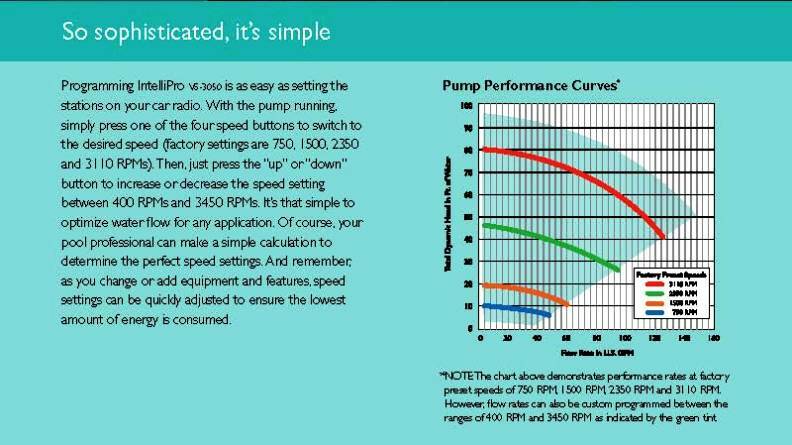 The selections of pumps, should be based upon the overall hydraulic evaluations of the systems requirements, while achieving the most efficient performances, not just more horsepower! 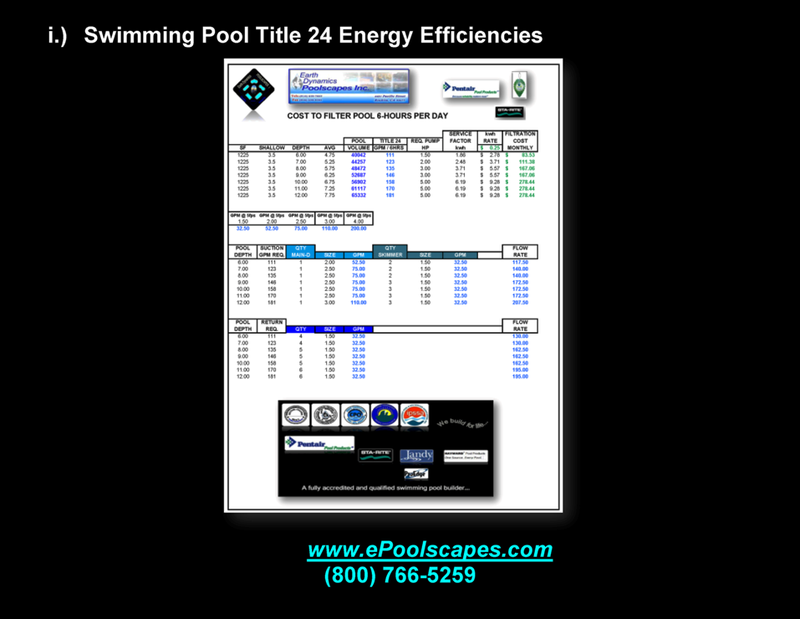 Click HERE to learn more about Swimming Pool Energy Efficiency! 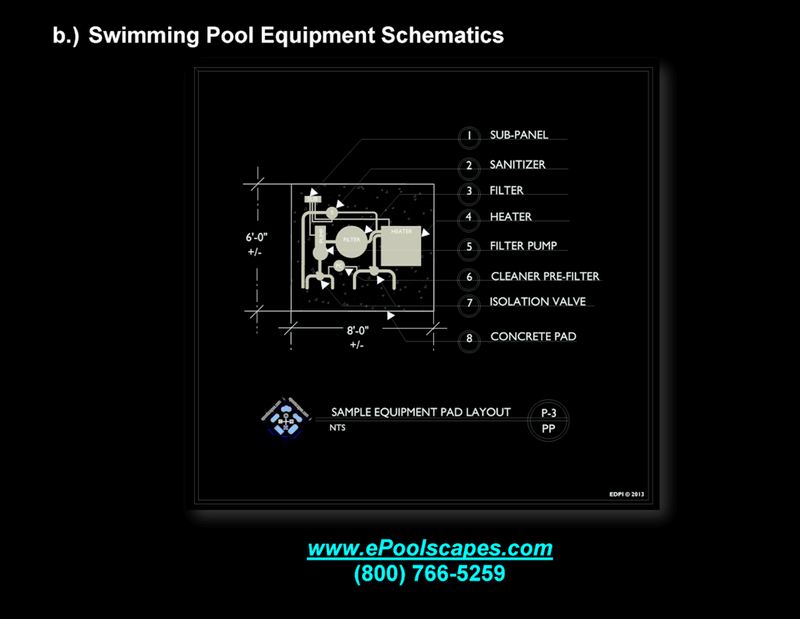 The assessments for the other equipment components will also involve providing for greater energy efficiency over the life of your swimming pool. 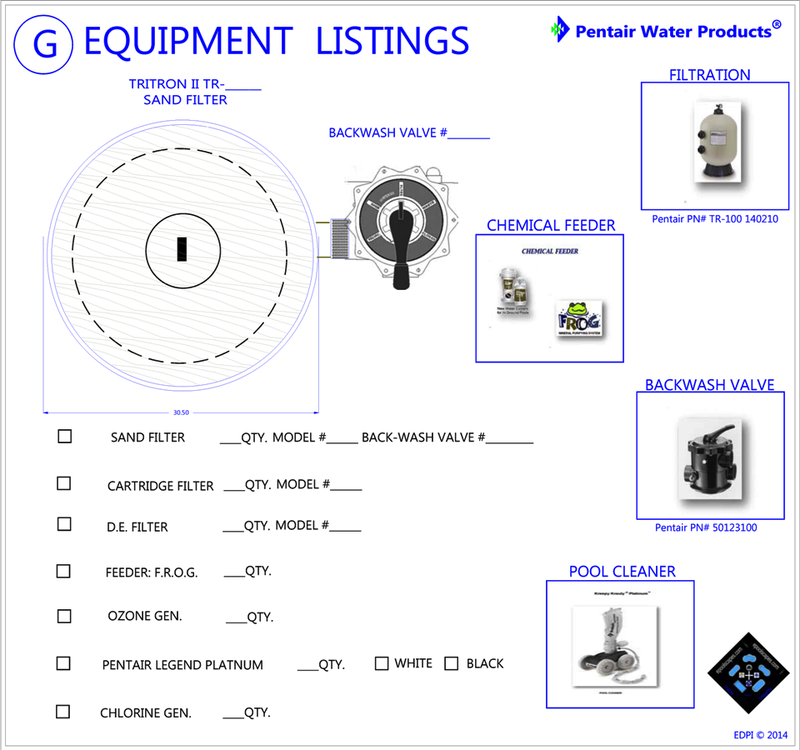 The type of filtration selected (Sand) can account for as much as $455.00/Yr. 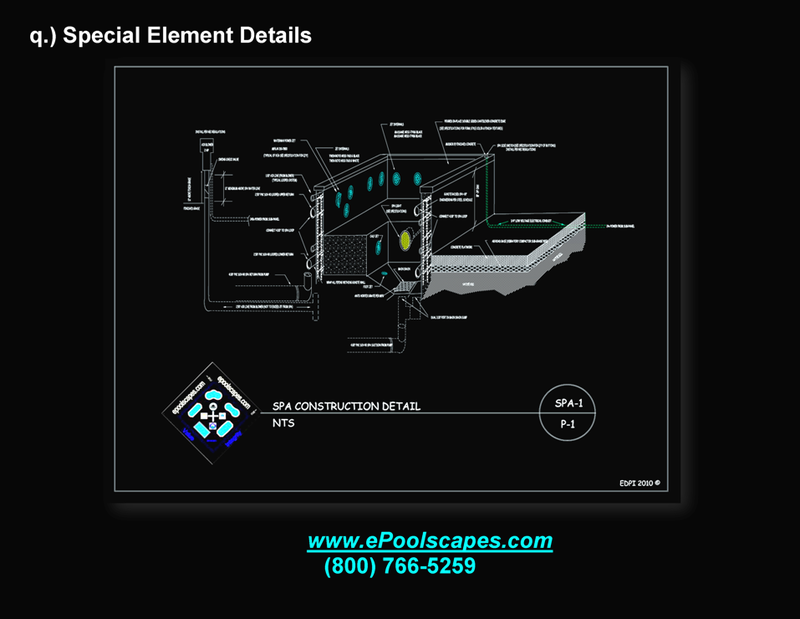 in electrical energy savings and another $200 to $300 per year in element replacements. 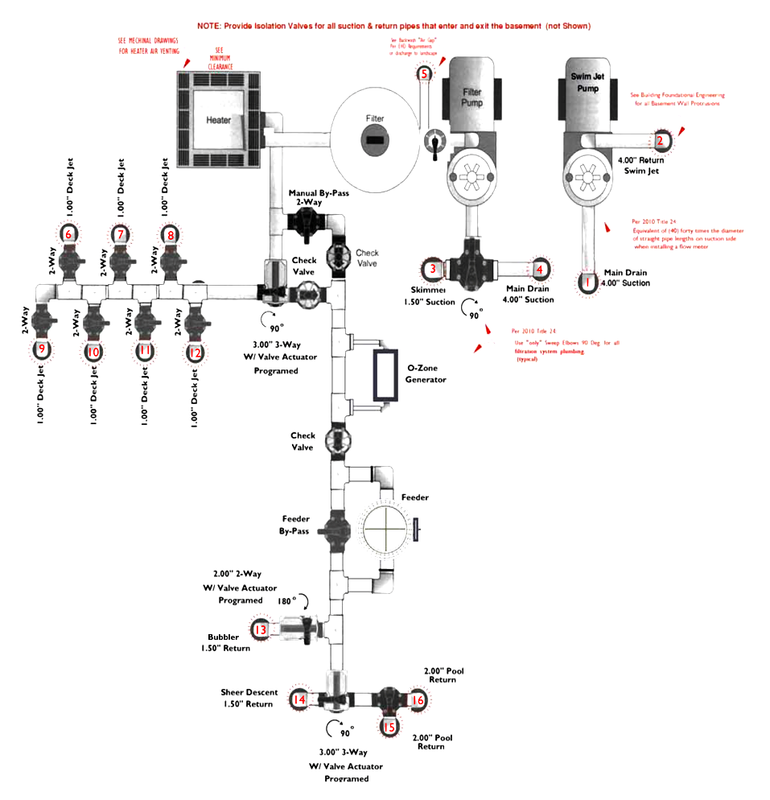 The assessments for special features can involve utility runs, as well as a determination for the sizes and required capacities of pipes, conduits and wiring. 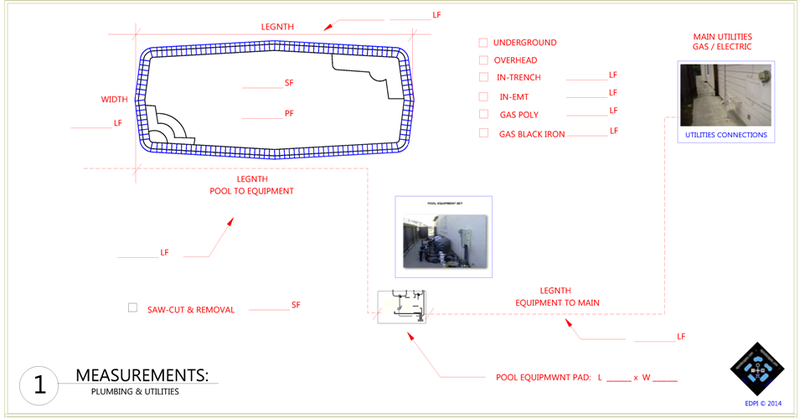 If a Fire Pit and or Water feature are intended, then the modes of operation whether manual or automatic should be identify in the operational capabilities of a diagrammed intention. 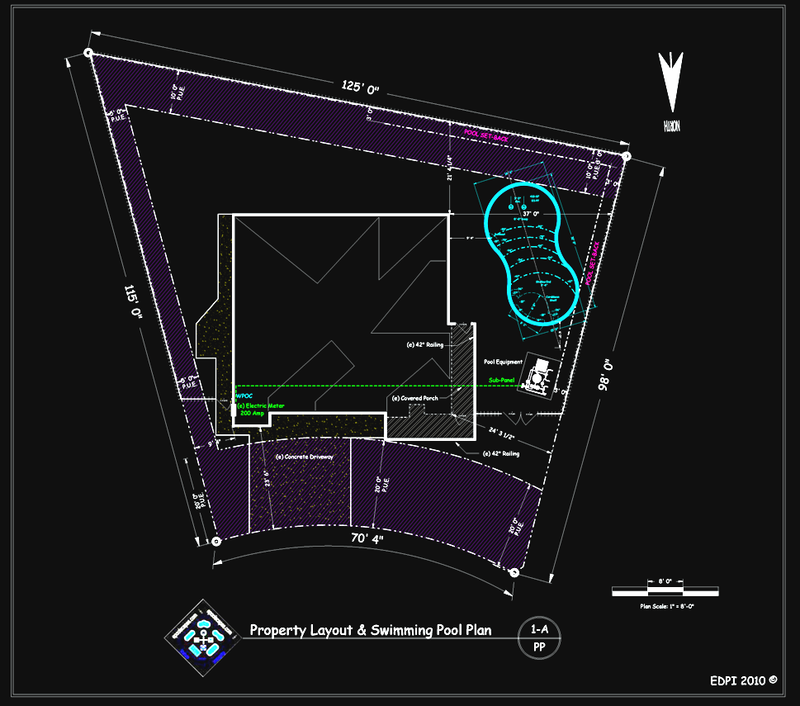 Click HERE to view example. 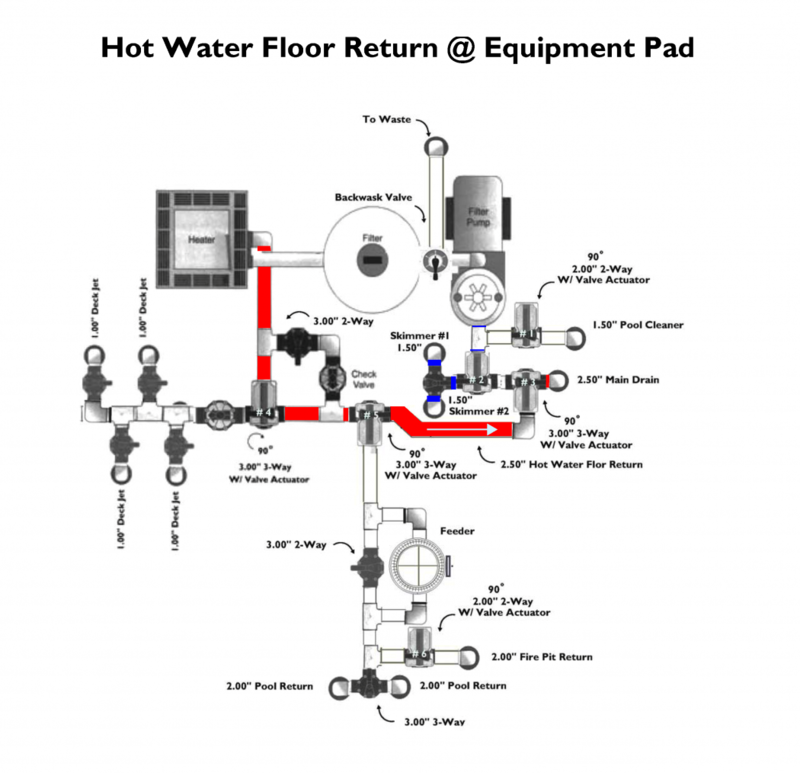 The Equipment Pad installation can have several “options” that will greatly effect what you are actually paying for and ultimately receiving value from. 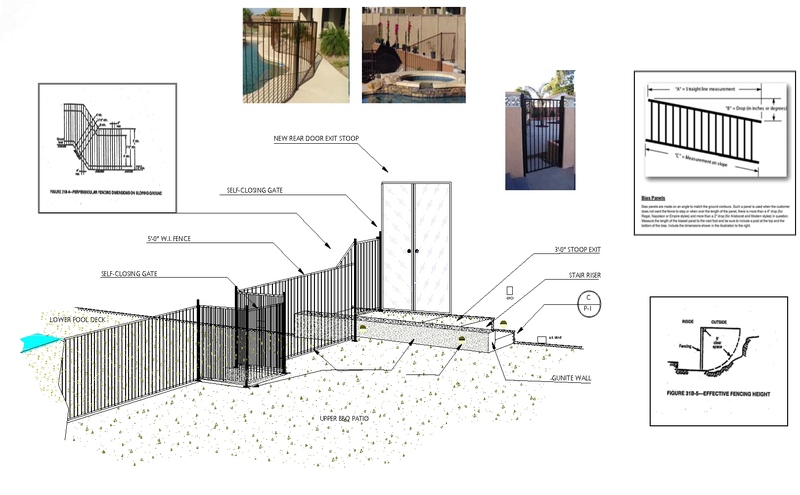 A swimming pool Safety Barrier (fencing) will be required, per code together with self-closing gates securing the pool’s area, click HERE to view example. 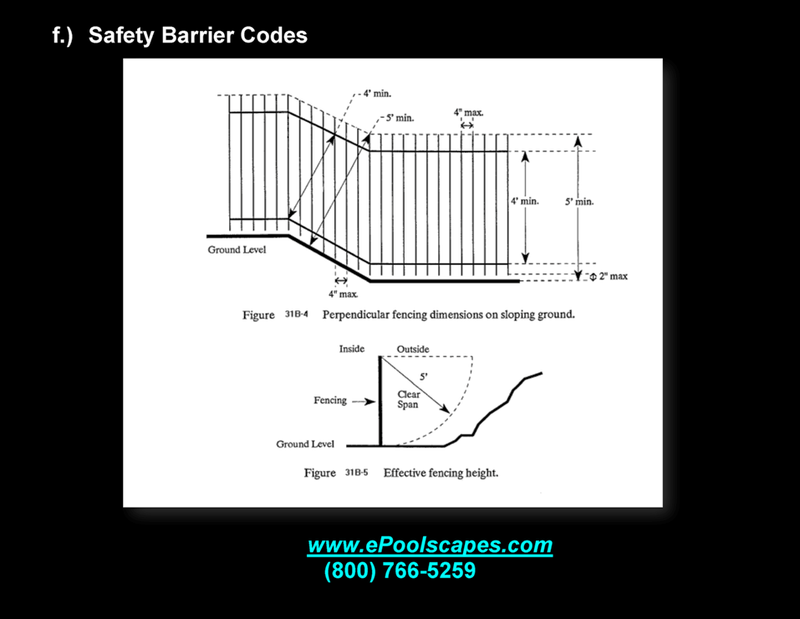 The existing yard fencing may or may not meet this mandate so, realize that additional fencing may be needed. 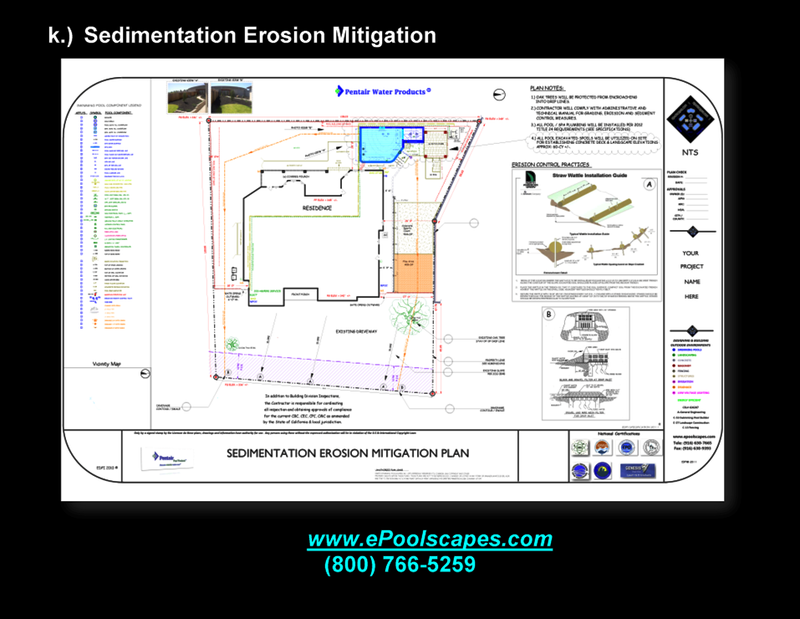 It is important to become aware of your yard’s existing conditions, and if these are to be required, than they will need to be included in your estimate. The values expressed in an estimate should represent the application of “due diligence” in measuring and quantifying the requirements. The greater the attention to detail in engaged this process, the greater the potential for accuracy.The greater the expressed accuracy, the greater the accountability for the intentions being professed. 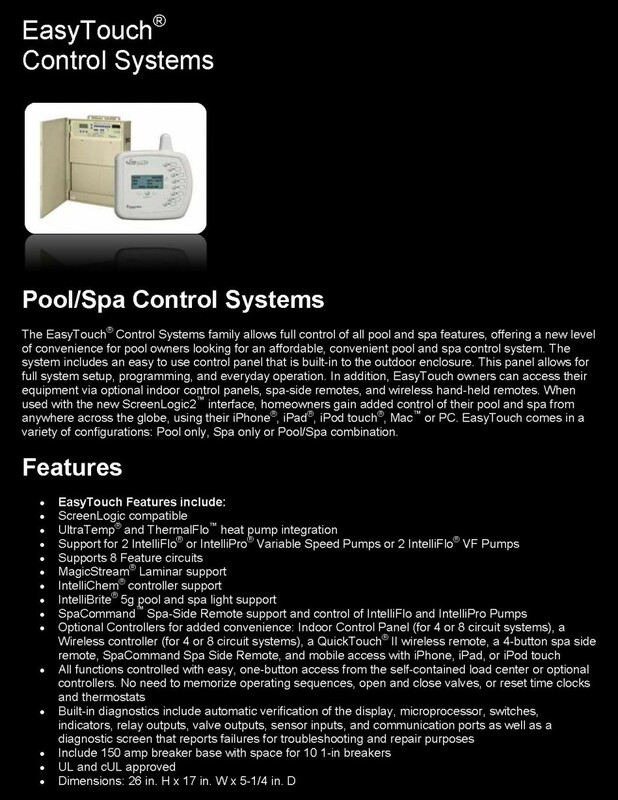 There are many attainable possibilities for the results in building an In-ground Hydrotherapeutic Spa. 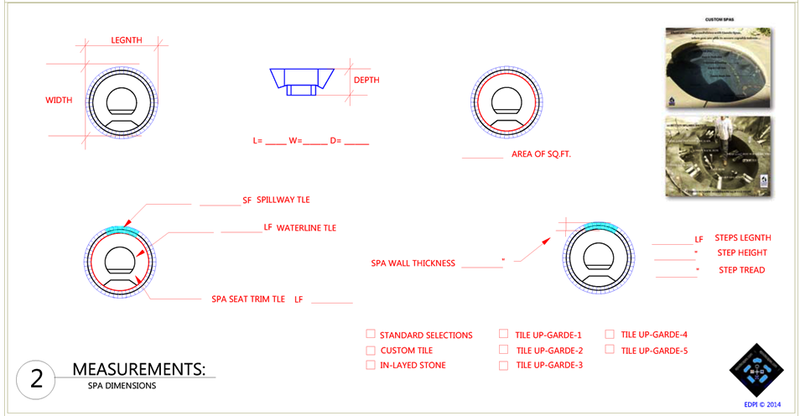 In starting with a clearly defined diagrammatic approach, the expectations will be anchored in a descriptive meaning for the authentication of the values that are expressed in an estimate. 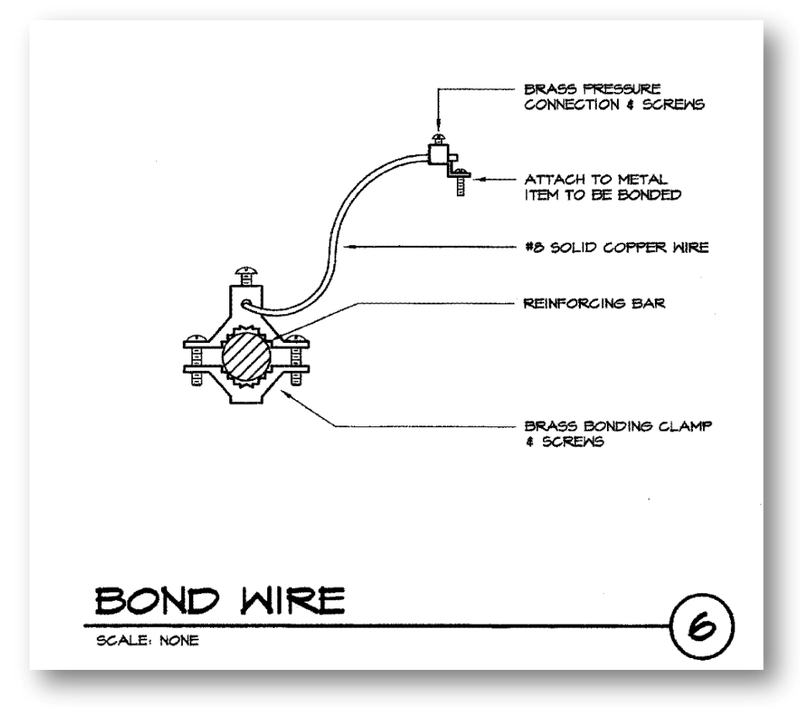 The term “Bond Beam” refers to the entire perimeter (structural steel reinforcements, combined with the Shotcrete Shell). It is located at the top of the structure. 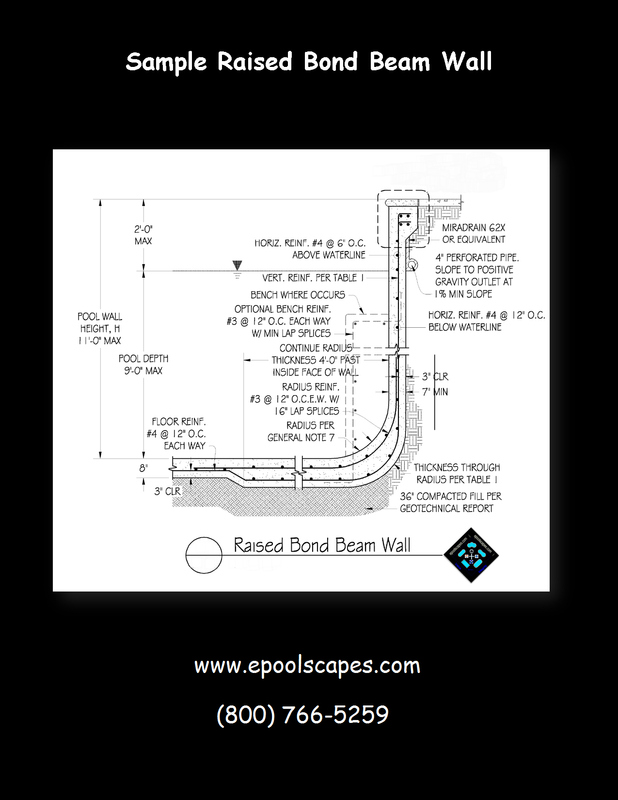 When a section extends above the the waterline elevation, it is called a “Raised Bond Beam“. 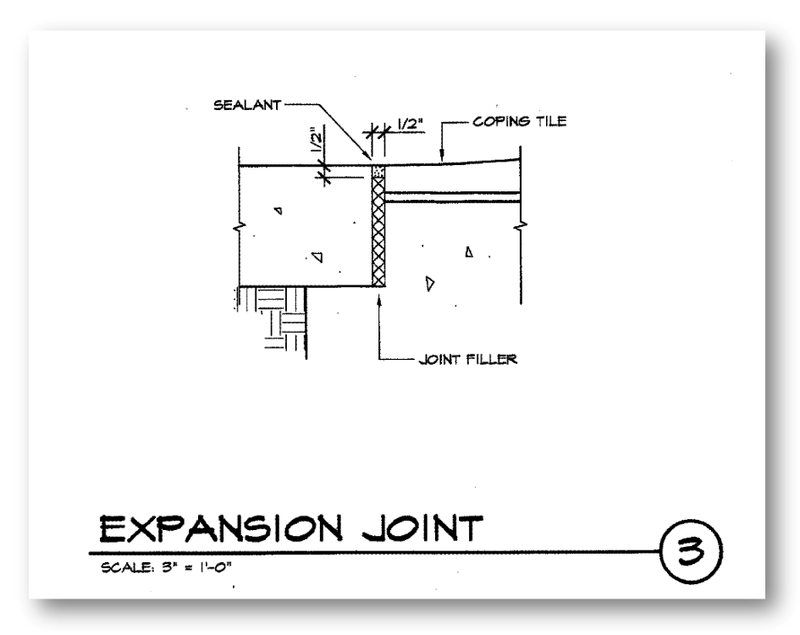 Estimates should reflect the height in inches, length in feet and comply with the engineering. 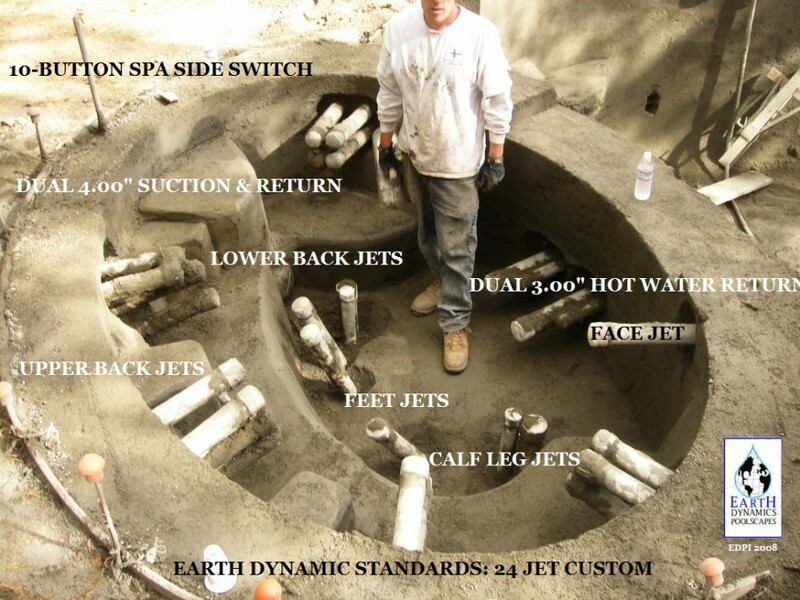 The term Gunite or Shotcrete refers to an application of air blown dry mix concrete, that has water injected at the end of a large hose. 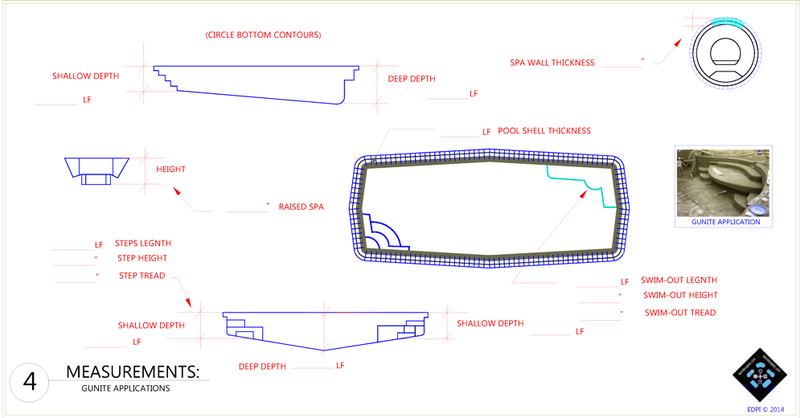 The concrete mix material is shot over, under and around the steel reinforcements to the specified engineering prescription, required for meeting the shell’s thickness and contours. Realize that real contributions just don’t happen by themselves and that the best results can’t happen if experience and knowledge in planning doesn’t take place, first! The idiom “the devil is in the detail” was actually derived from the earlier phrase, “God is in the detail;” which was expressing the idea that whatever one does, one should make sure that it’s being done thoroughly; i.e. details are important! If the assessments evaluations for the necessary performances aren’t being anticipated, then you most likely would be getting them included in the price! 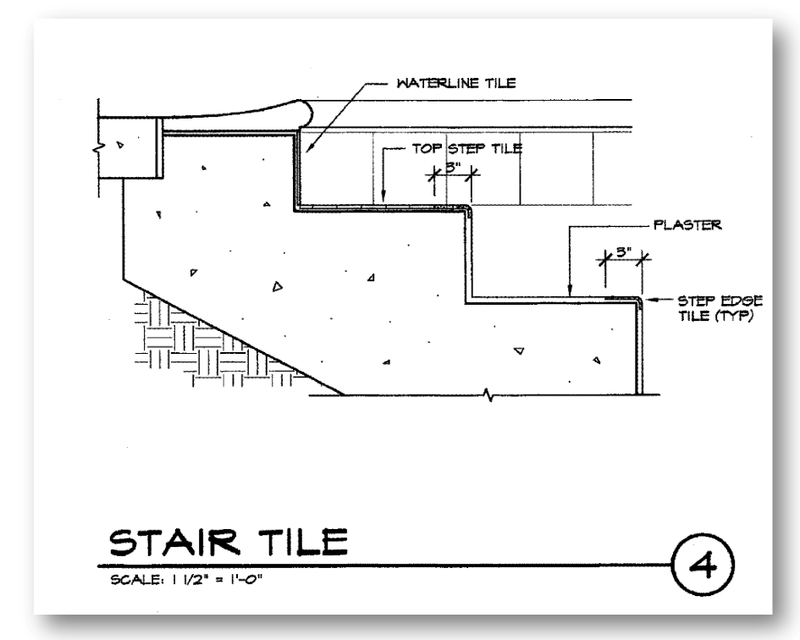 If a Builder fails to comprehend the level sophistication for what should be laid beneath, then you can expect to see Change Order increases to the price. Change Orders can often lead to dissatisfaction and disappointment and these have a mutual fault in as a result of being ill prepared! For the Consumer had an opportunity to enforce a prescription prior to deceiving themselves into believing that something unbelievable could be obtained from something priced so unbelievably inexpensive! Such illusions are most often fueled further by the nativity in understandings for what actually goes into building something that can encapsulate longevity and lasting value. It is in this state of corrupted meaning that the superficial evaluations aspire into being suggested as plausible by Builders that sell on price and the temptations of building some less substantial becomes the new standards for lowering the bar rather than raising it!. 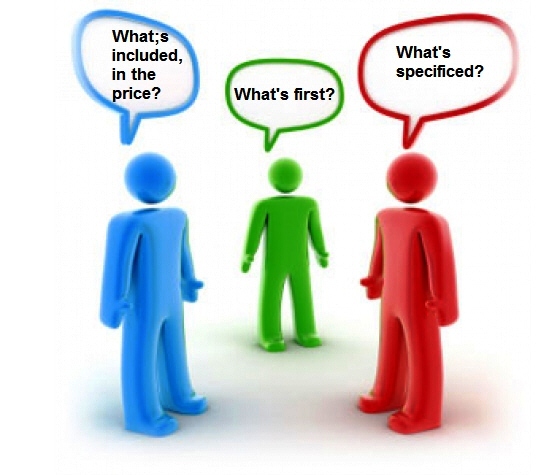 The Alphabet for Scribing Measured Value to Pricing…. 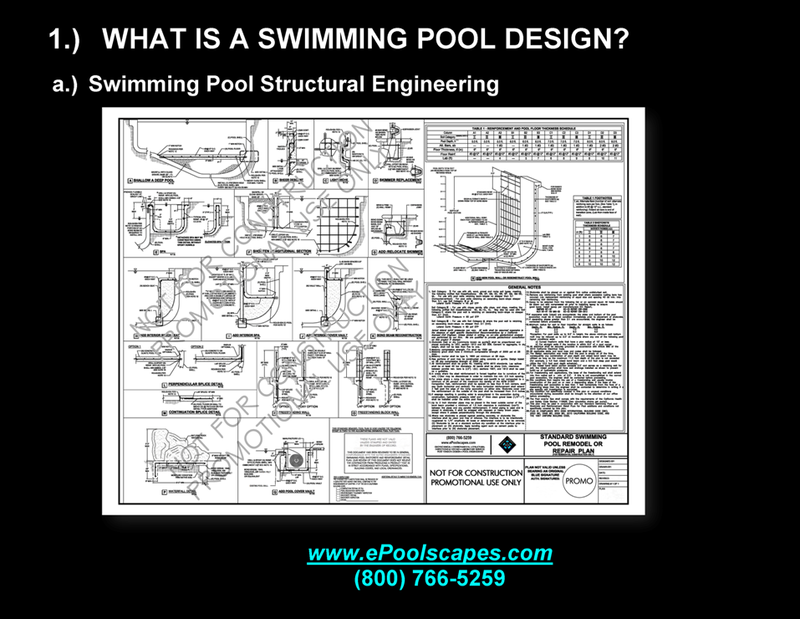 Please view the imagery below for many of the possible considerations that can become part of a well planned approach to preparing to build a swimming pool. 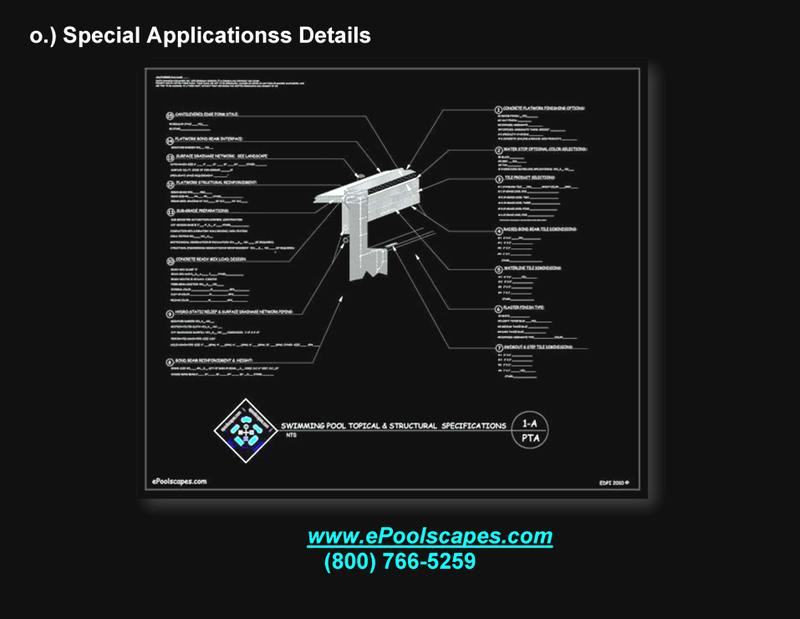 If you have gotten to the end of this webpage and can see the value in organizing your solicitations well then, we have an special offer for you! 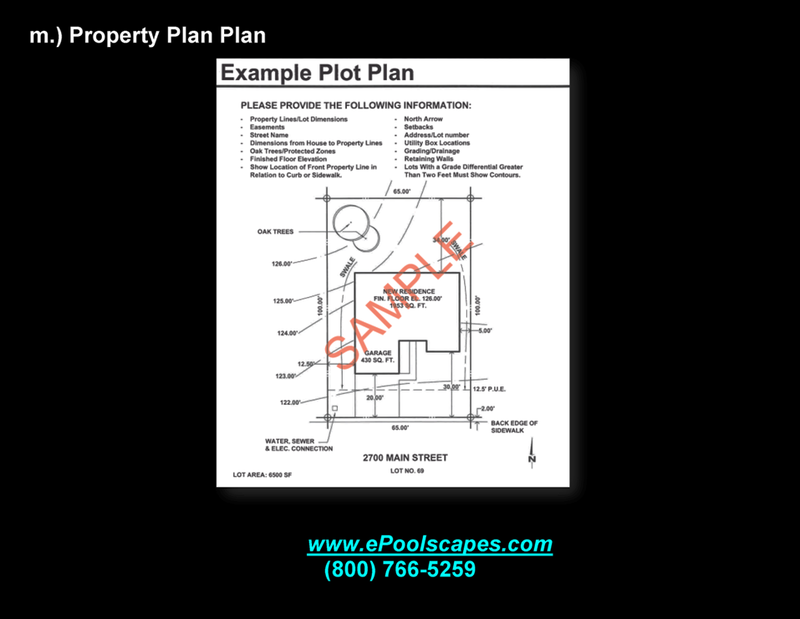 On a fee basis, we’ll prepare your plans and specifications for a Permit Ready Building Permit submission. 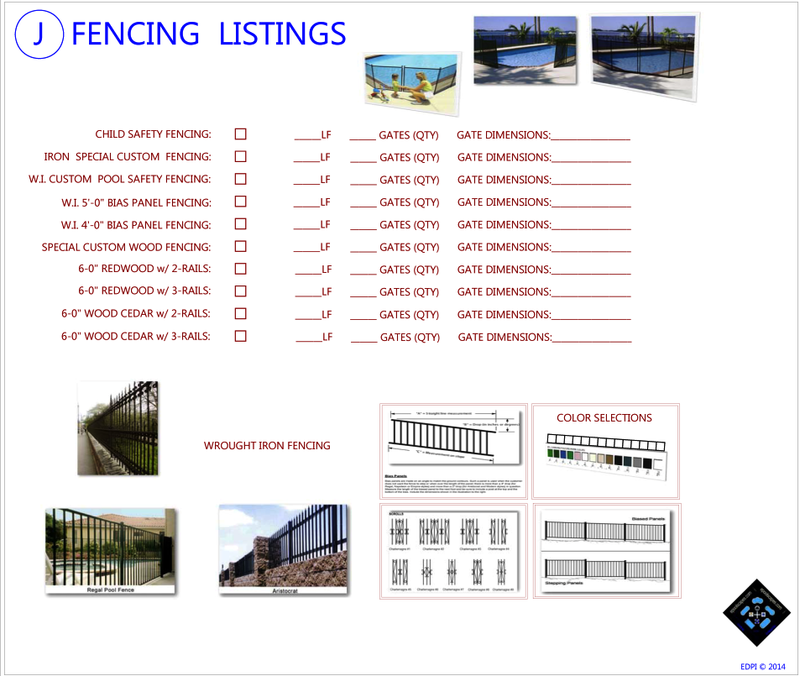 When these plans are completed, you will have participated in calling-out everything desired and you truly will have a set of plans that will provide your with a 1st class standard. 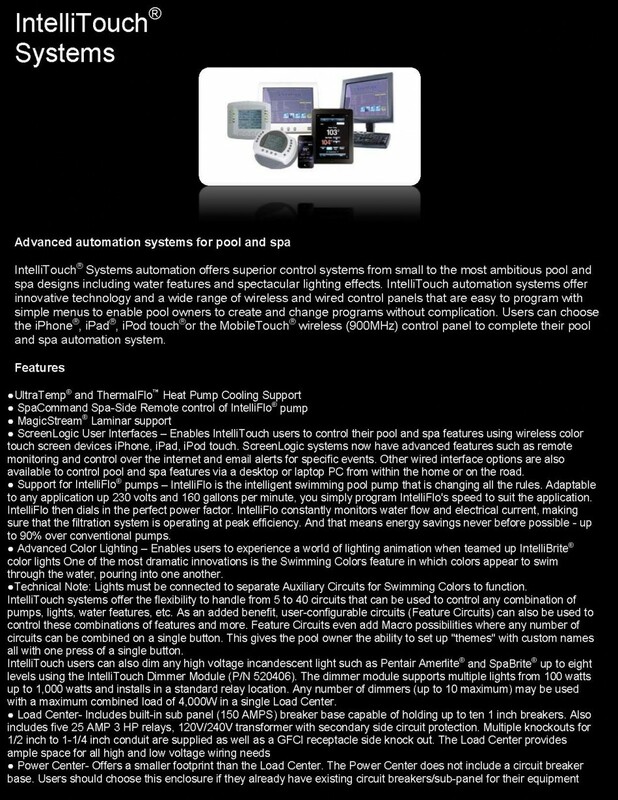 You can then solicit anyone you’d like to compare to our pricing for the “per plans” and “specifications” approach. 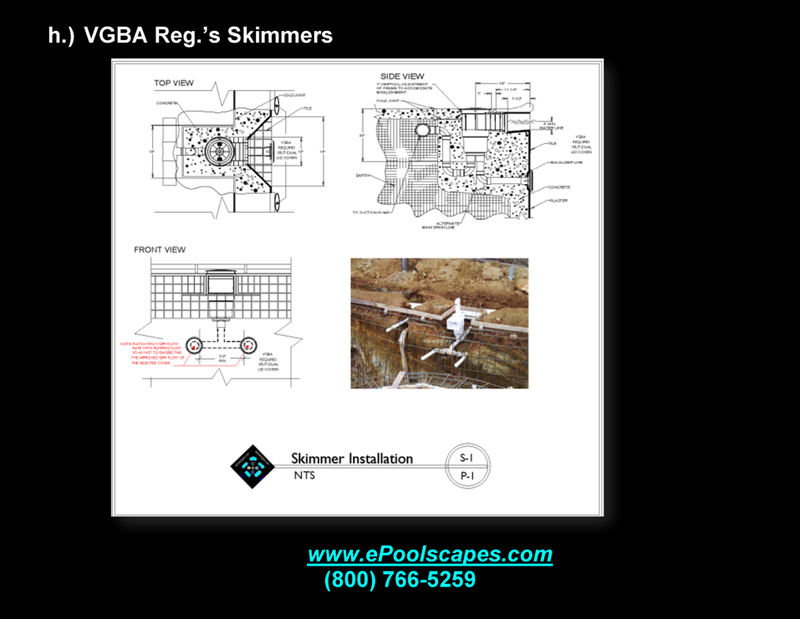 If you receive a legitimate lower bid from a qualified Licensed, Bonded, Insured Swimming C-53 Swimming Pool Builder, the plans are free (conditions apply)! 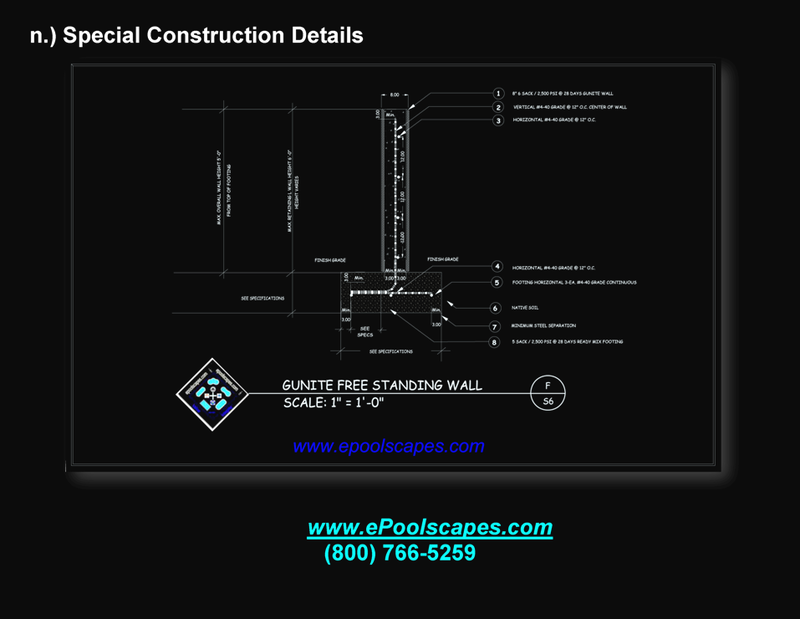 If you wish to use the plans for other reasons, you can also purchase them at the established fee based value. 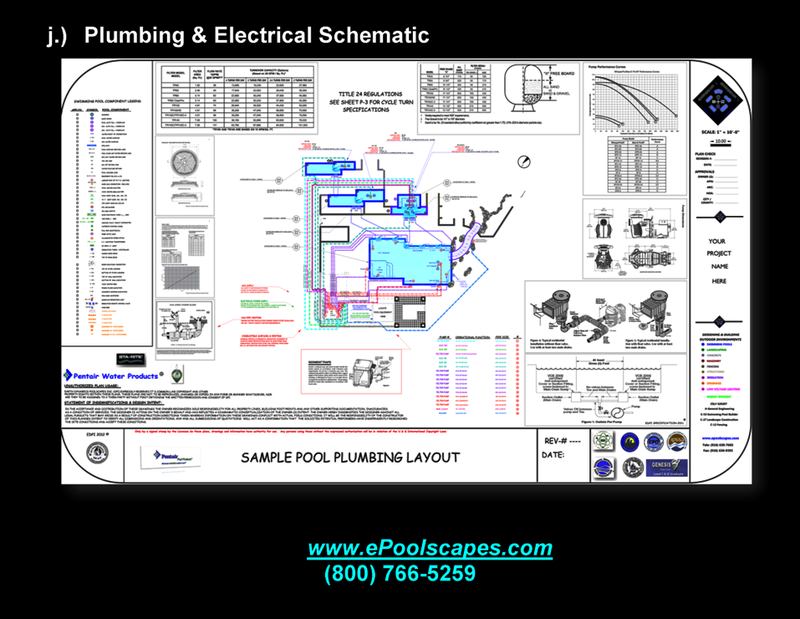 The bottom line is that you will have great plans that will deliver a 1st Class Standard and something that truly can be compared!